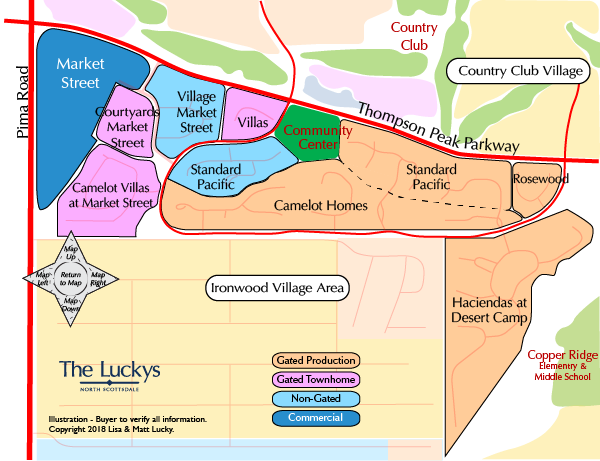 Desert Camp Village offers neighborhood parks and trails linking the village to the entire DC Ranch community. The community center, called Desert Camp community center, features a 25 yard swimming/lap pool plus a tot pool. The community center also has two tennis courts and basketball courts which are both equipped with lights, children’s play area, fitness room, men’s and women’s dressing rooms, and many other recreational activities. Close to shopping at Market Street Village. Market Street offers shopping and dining opportunities, including a grocery store, Fleming’s Prime Steakhouse, Grimaldi’s Pizzeria, The Herb Box, and many other shopping boutiques and specialty stores. For that “resort feel” consider Desert Camp Village with many amenities all within walking distance. See all Desert Camp Area New. See all Desert Camp Area Sold.